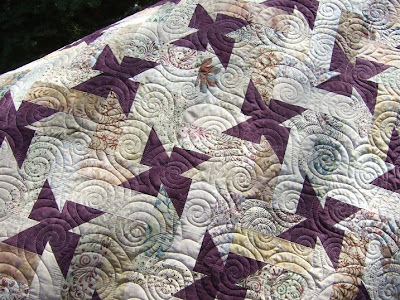 I finished quilting my Twinkle quilt which was a pattern from Kim Brackett's book Scrap-Basket Sensations and am now putting the binding on. 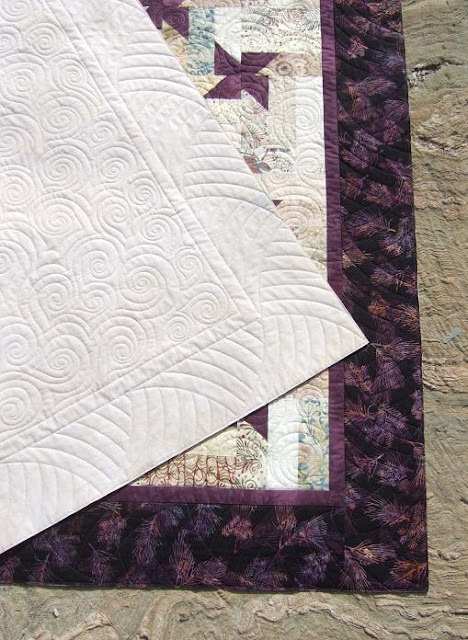 I decided to do free hand swirls in the center and the echo curves in the border. I think I need to buy the rest of Kim's books as they are great! At first I thought I would SID around the purple stars but then changed my mind and just did the swirls right across. I had my Rulermate extended base plate on my machine for doing the ruler work in the borders and found doing the free hand work in the center a little trickier than normal. I kept bumping into the roller bars as as it reduces the usable quilting space I have when it is on and I kept forgetting I had it on. I used Quilter's Dream Cotton Deluxe on this quilt to give it extra loft and once I wash it that should crinkle it up nicely. I dyed the backing to match the light coloured fabrics on the front. It is hard to see in the photo but it is a beige/peach colour and I used the MX Procion Chino to dye it. Still lots of snow as the temps are still getting down to -10'c at night and only highs of 4'c during the day so very slow melt this year. Well last night was my last meeting as guild president and it was a great meeting. Lots of members showed up help with our quilt show preparations and our volunteer sheets are filling up. That was great to see. I am feeling very excited that our show as it is going to be a lot of fun as we have such a great group of ladies. Today all I have planned is to bake cookies for the show, get all my and Lori's hand dyed fabrics tagged for sale....and yes we will be offering a discount at the show on our snow dyed fabrics. 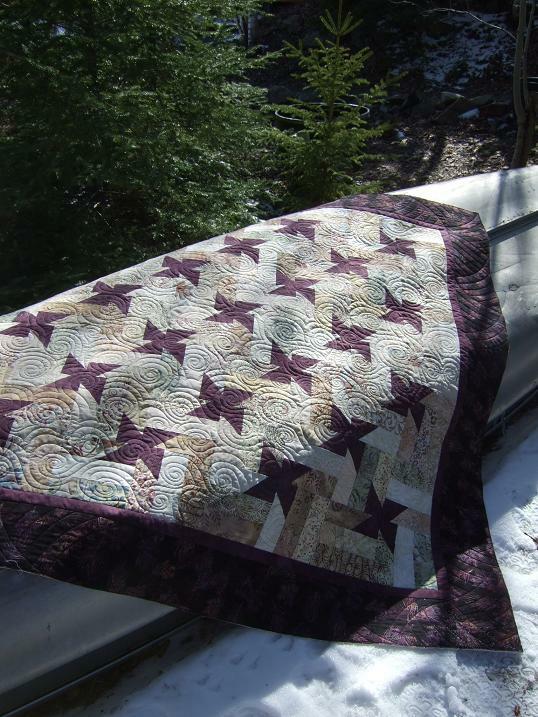 Then load up my car with quilt frames, hangers, etc to deliver to the hall tonight and tomorrow the set up begins. I'll take pictures and share on the weekend. Wow those are some awesome freehand swirls, I so wish I could do that. 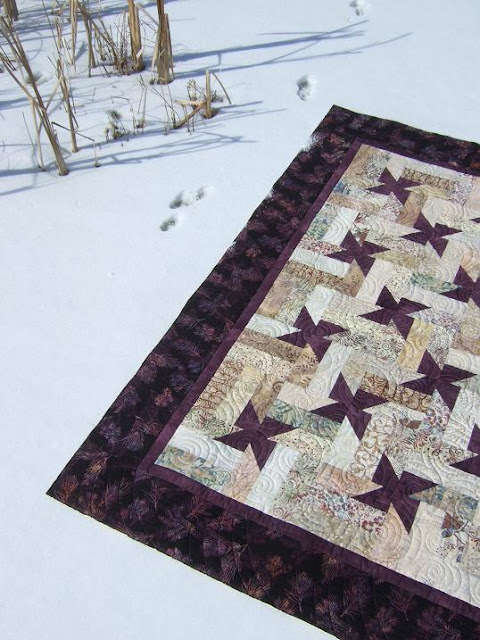 I love the border and may try that on a quilt, just beautiful! 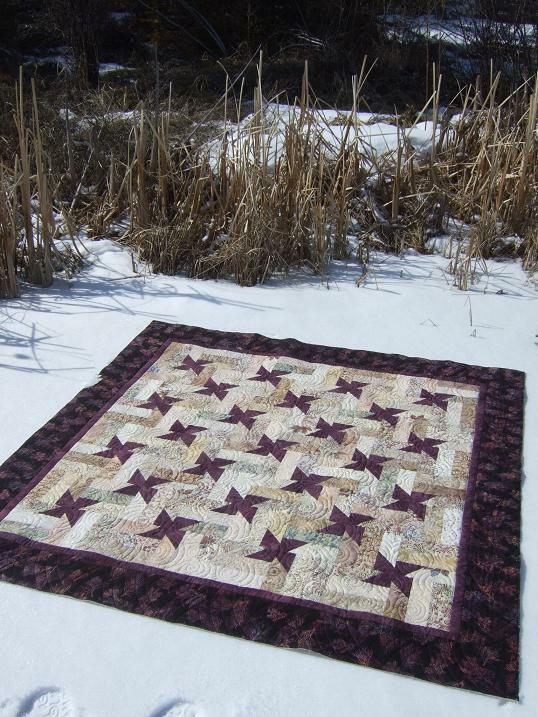 Lovely quilt, Kathy. I have both of Kim's books and love the ideas in them. 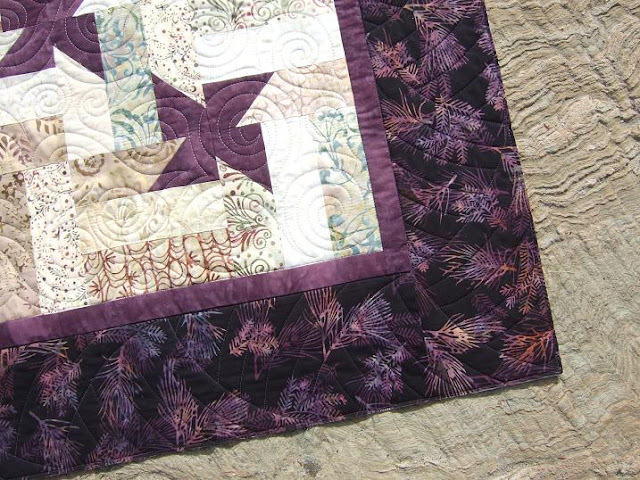 Looking at your border quilting reminds me - I want to say a big THANK YOU for the tutorial you posted on your blog for how to quilt this design. I used it for the quilt I just finished last week, and it turned out so beautifully. Your instructions and the photos made the process very easy to follow. Kudos to you. Looks so good Kathy! I just love that border design. I keep my base on all the time. I ended up moving my front bar closer to me and then I didn't loose quilting space. Make sense? Beautiful guilt. I also have this book, but I did not make this one, yet. I have a Bali strips package, my be I will use it on this pattern. Love to see also the rest of your blog.